Sawyer's Heart Project provides immediate support and comfort to bereaved parents who have experienced a pregnancy loss, stillbirth, or the loss of an infant through distribution of hospital memory boxes in the Chicago area. We are honored to provide Sawyer's Heart with 96 diapers for their memory boxes! These diapers were handcrafted by our very own Vanessa and have been donated in memory of Sawyer Erik Williams. "Sawyer's spirit lives on in the hearts of many who he touched so deeply in his brief life." As a passionate diaper activist in her own right, Vanessa has officially joined the Teeny Tears team as my partner in crime behind the scenes. We are on an ambitious quest to Diaper the World. Vanessa is an amazing mom to three special little angels: Adam, Cayla, and Marley. She had been looking for an economical and unique project to do in honor of her babies when she stumbled across our project through Utah Share and loved it. She immediately organized a sewing event and posted it on FB, inviting friends, family, and fellow angel mamas. They answered the call, packing along sewing machines, scissors, safety pins, and all the flannel they could carry! These super sewers labored to create 412 diapers. 160 have been donated to photographers of NILMDTS of SLC and are not pictured. 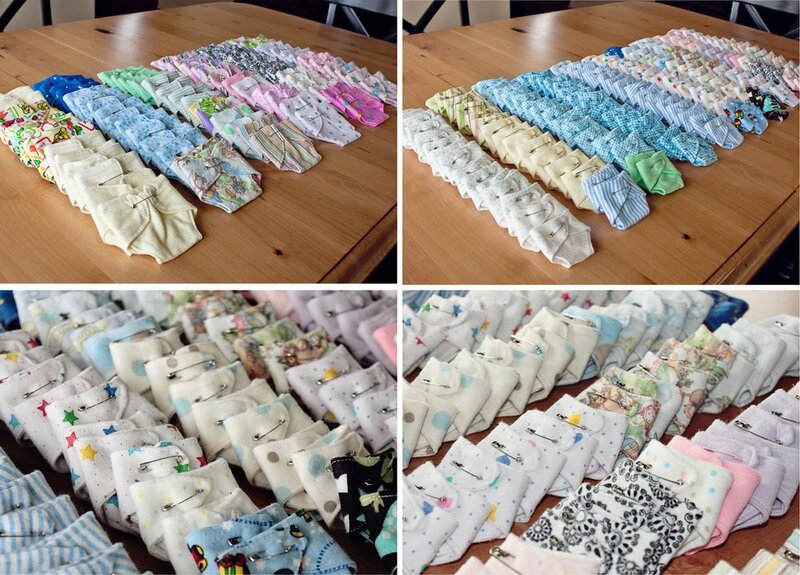 These diapers below (all 252 of them) have been donated to Jordan Valley Hospital, Pioneer Valley Hospital, Tooele Hospital, and the University of Utah Hospital. Some have been donated in memory of Adam, Cayla, and Marley Pollard. Some have been donated in memory of Evan and Isaac Marsh. Some have been donated in memory of MaRee Cowart. All beloved angels, gone too soon. 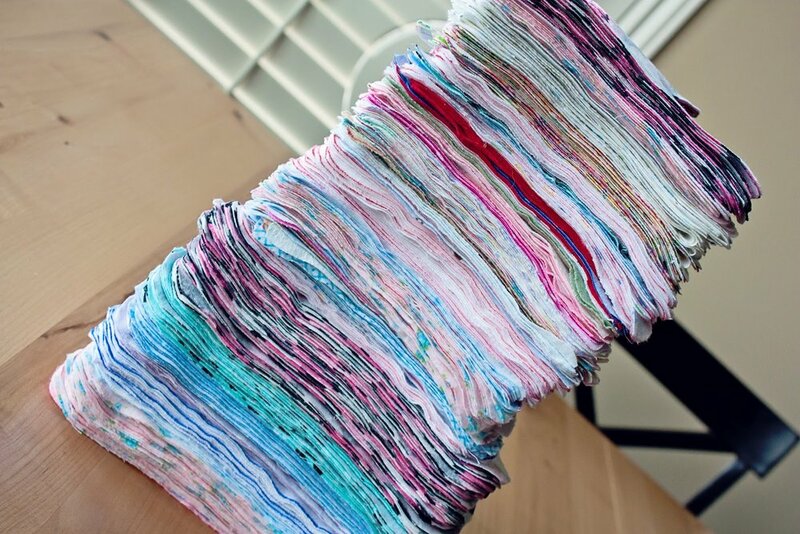 The 412 count does NOT include this exciting stack of leftover unsewn pieces! Vanessa posted many wonderful things on the wall, including WHY she was doing the project (click to enlarge and read their beautiful story). Elsewhere she posted full sewing instructions for the crafting teams. Great event, great people, great food, great feeling. "I am in receipt of the beautiful hand made colorful cloth diapers that were so lovingly made for our tiny patients. I first want to express the gratitude of our families at receiving such a lovely handcrafted item. Please understand that they want to keep everything that their baby has worn, including the diaper. Suffering heartbreak and loss of such a tiny innocent baby is tragic but thoughtful little items like these help them understand that people care about them, their baby and what they are going through. All of the items have been appreciated and I am overwhelmed by the thoughtfulness of this gift. Each and every diaper will be lovingly given to and used on an angel baby. Giving to others is tremendously healing and brings a sense of comfort in knowing that we are serving humanity. As the chaplain at our facilities, I send thank-you’s from everyone as they marvel at the beautiful work. Again, thank you from the families who so appreciate what you are doing."